When you hear the word Panasonic, what comes to your mind? Electronics! Panasonic is one of the leading electronics companies in the world. While it’s commonly known for cameras, audio systems, and TV sets, the company also makes some of the best vacuums. Today, we take a look at the best Panasonic vacuum cleaners that you can buy in 2019. So, what’s to love about Panasonic vacuums? This stands out as the best option for anyone who wants to explore Panasonic vacuums. It powerfully picks up dirt, debris, and pet hair from hard floors as well as carpets and rugs. Automatic height adjustment allows a smooth transition from carpets to hard floors. That, in addition to its wide cleaning path, makes vacuum cleaning a walk in the park. Also, there is some good news for allergy sufferers and those who struggle with other respiratory problems like asthma. First, being bagged, emptying is never messy. Allergens will not be blown onto your face during this process. Secondly, the bags are made of HEPA media. This means that up to 99.97 percent of pollutants will be trapped inside the bag. Lastly, a good vacuum must have appropriate attachments for above-floor cleaning. The Panasonic MC-UG471 bagged vacuum comes with a few of those. The attachments include a dusting brush, a crevice tool, two extension wands, and an Air Turbine brush for pet hair. If you’re in search of the best bagged Panasonic vacuum or the best bagged Panasonic vacuum, this is the answer. Click here to see its current price. Just like the MC-UG471, this Panasonic vacuum also delivers top-notch performance. 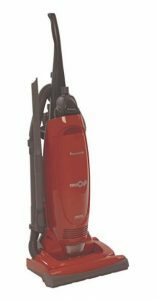 Thanks to a powerful motor, you can easily pick up dirt and debris from bare floors, carpets and area rugs. Automatic height adjustment allows you to have a smooth transition. Also, edge cleaning is very straightforward. While it’s not HEPA-standard, the fact that it’s bagged is a huge plus. As mentioned before, bagged vacuums are better than bagless ones at handling allergens. So, even though it may not deal with pollutants as well as the MC-UG471, it is still effective to some degree. Lastly, you also get a few attachments that help with cleaning upholstery, drapes, and so on. These include a stretch hose, two wands, a dusting brush, and a crevice tool. This vacuum is also quite similar in design to the first two options. With a powerful suction, it easily picks up dirt and debris from hard floors, carpets and area rugs. However, just like the MC-UG223, it lacks HEPA filtration. This may be critical for anyone trying to fight allergens. HEPA filters are the best when it comes to capturing pollutants such as pollen and dust. Also, you get a few tools to help with above-floor cleaning. These include a crevice tool, a dusting brush, and two extension wands. Panasonic is not as popular as Shark or Dyson when it comes to vacuum cleaners. However, the company’s products are outstanding and have been for ages. 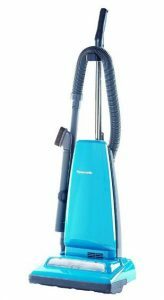 In this section, we summarize what makes the best bagged Panasonic vacuums stand out among so many options in the market. For any vacuum to do its work well, it must possess a produce strong suction. Panasonic vacuums are powered by 12-Amp motors that help to put them among the world’s best. Picking up dirt, debris, and pet hair, therefore, is very easy with any Panasonic vacuum. All the best Panasonic vacuum cleaners can be used for different floor types. So, if you have hard floors, carpets or area rugs, you don’t need to buy separate vacuums for each. 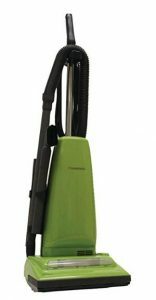 A good vacuum such as the Panasonic MC-UG471 Bagged Upright Vacuum can handle everything for you. All the vacuums listed in this review use bags. As indicated earlier on, bags are better at handling allergens because emptying is usually mess-free. However, if you really want to eliminate pollutants and keep the indoor air quality outstanding, you need HEPA filtration. Among the three vacuums, only the Panasonic MC-UG471 has this feature. A wide cleaning path is essential, especially if you have to clean large rooms. This means that you need to de very few passes in order to complete the task at hand. Panasonic vacuums have the widest cleaning paths in the market – with the best Panasonic vacuum measuring 15 inches. Another thing that makes Panasonic vacuums stand out is the fact that you get attachments. Accessories such as hoses, dusting brushes, and crevice tools are useful when cleaning above-ground areas and hard-to-reach spots. Durability is a huge plus. Panasonic vacuums are made of durable material to ensure that they last for ages. Also, a motor protection system ensures that the motor and fan are not damaged by dirt and debris. All dirt and debris are swiftly directed into the bag thus preventing contact with the fan and motor. There are vacuums that cost hundreds of Dollars, but they can’t match Panasonic vacuums. All the vacuums on this list cost less than 200 Dollars, making them among the most affordable yet efficient vacuums. At the end of the day, you must get value for money. And Panasonic vacuums are some of the best value vacuums in 2019. If you are looking for the best Panasonic vacuum, look no further. This is the ultimate list of the best Panasonic vacuum cleaners in the market presently. The best option is the MC-UG471, but if you are on a tight budget you can consider the MC-UG223.